Rob Roy will be back on the Scottish Junior Cup glory trail on Saturday when they take on Glenrothes in a first round tie at Guy’s Meadow. Stewart Maxwell’s side got to the quarter-finals last season and will be heavy favourites to dispose of the Fife outfit who play in the second tier of the East Region . But Maxwell knows his players can’t afford to take anything for granted if they want to avoid a shock early exit. He said: “The majority of our squad were there when we got to the quarter-finals last year so they’ve had a good taste of it. They’ll be hungry and that will bounce off the new boys. “We’re looking to make our mark on the Scottish Cup again and get as far as we can. On our day we can match anybody, but you can’t take anybody lightly. 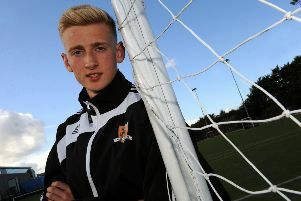 “Glenrothes will come down looking to play a Super Premier League team and take a scalp. On the day they might turn up and perform and we’ve got to be at our best. “You don’t get second chances in the Scottish Cup [if you lose]. It’s a cup tie and that’s the reason why - you’ve got to go and perform. “Whether it’s ther first round or the quarter or semi-finals you’ve got to approach it the same way so they’ll be well warned. Maxwell has added to his squad’s defensive options by signing centre-back Mikey Morris from Kilwinning Rangers.